Describing herbs accurately, giving interesting information and activities involving herbs is the purpose of this website! Pull up the yellowed parsley plant, place a sheet of paper on the table, Cut the florets off the plant. Rub the seeds freely from their moorings. gather the paper into a funnel shape. Tip the seeds into a narrow tall jar. Shake the jar of seeds. Remove the little sticks and hairy bits from above the seeds. Then gloat at the nicely harvest of Parsley seeds. Remember to plant them before 17 days or earlier after harvest. Make sure that all the weeds in your garden are Parsley!! 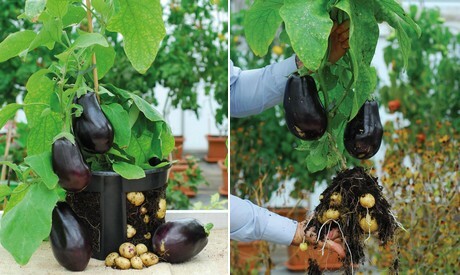 A British group of scientists have evolved a potato plant which produces potatoes underground, but simultaneously produces Aubergines, Egg Plants on the stems above ground. This genetically modified Solanum is being sold as the racy name of “Eggs and Chips”. Space Scientists have grown Orange flowered Zinnia, without gravity, in space! The petals are edible. Other articles on the web have revealed that cucumber and zucchini were grown in space in 2014. The aroma of sweet peas is unique, especially when a huge bunch is placed in a vase indoors on a cool marble shelf. The confined place intensifies the scent, heaven sent! Mauve, white, palest pink and vivid heliotrope purple blooms give a superb fragrance, rich and heady. Pure bliss. Early Summer is here. The Nettles, Urtica dioica, have gone to seed, all are harvested as the seeded plumes dry on cloth in the full sun and the seeds collected in a paper bag for sowing later. The red chard seeds are ripening, while the pink Asiatic Lilies lasted in full glory for only one splendid week. Now the Feverfew, Tanacetum parthenium, with whitely brilliant flowers out shines the tiny palest mauve Vervain flowers, Verbena officinalis, and the subtle scented white blooms of Valerian, Valeriana officinalis. In full glory is the swathe of Basil Mint, its rounded leaves, richly green. In a very hot spot show- casing gorgeous magenta flowers is the single Rose, Rosa rugosa ‘Rugspin’.